The Arctic Cove 700 is our pick for the best evaporative cooler, in which you can add both ice and water for intensifying the cooling power. It has a remote control, has a timer option and is not very noisy with its fan motor. The air is distributed properly due to the presence of swinging vents, with a coverage area of 500 square feet. Our step-up pick is the Cajun Kooling CK4500 and this one is ideal for up to 1,200 square feet of area – great for larger warehouses and establishments needing cooling without an A/C unit. It uses a FLOAT valve system inside and can last up to 10 hours with a single refill of the reservoir, which has a total capacity of 32 gallons. The budget pick is the COMLIFE Personal Space and this small, portable and convenient USB-powered device can be placed in your desk to cool you down at work or while studying. It only uses power via USB with a consumption of 10 watts. Parts of an evaporative cooler. An evaporative cooler is a kind of air cooling device that is usually more portable and cheaper than an air conditioning unit. Not every person can afford to buy an A/C unit due to the operating and initial costs, which leads people to just use an electric fan instead, which is less effective. Therefore, if you are on a tight budget and cannot afford an air conditioning unit, the evaporative cooler can be a more cost-effective solution. Most of them can be used at home and even in office spaces. These can be small enough to fit into a desk so that you can get cooling action even at the comfort of your home or office desk without having to install a large unit on the ceiling or on the wall. These are also usually portable because some of them have wheels, eliminating the inconvenience of only having one room that is cooled down. The coverage area of these cooling devices might not be as good as real A/C units, but they do the job for summer heat. They are a good in-between solution between A/C units and electric fans. If you want a similar cooling power from an A/C unit but do not want to spend too much money on the upfront cost and monthly bills, this evaporative cooler can be a great solution for you. A/C units provide more power but are more expensive than evaporative coolers. These cooling devices work by adding ice onto the reservoir and the use of evaporative technology generates cold air within a room or given space or area. The ice that melts is what makes this device very simple but effective. It usually has less mess because of the design of the reservoir that keeps the device from leaking out the water and making it evaporate so that it will not spill over when ice has melted down. In the summer season, it is important to cool down but not spend too much on your electric bill. These kinds of units are great solutions for summer escapades, for really hot weather and for office spaces that are saving up on A/C units. Therefore, if your home or work area needs a lot of cooling but you can’t afford an A/C unit, you can go for an evaporative cooler instead. Capacity of ice or reservoir: the capacity can depend on how much power you need to cool down a room, the size of your room and how long you will be needing the device to run. For instance, if you work on a regular day shift, it should have a large reservoir so that you and your officemates can experience the cooling power for a very long time without having to refill the ice more frequently. Effective power coverage area: this will depend on how long you intend to use the device and the size of your room. You should have a powerful one or a larger one if you intend to run it for a long time and for a large room. On the other hand, if you just need a desktop buddy at hand, you can just check out those less expensive and portable evaporative coolers out there that do the job just fine. Ease of usage: you should also consider a unit that is very easy to operate and to adjust the settings on. Most will just have simple controls like you would on an air conditioning unit, except that the process could be simpler. Most will also have controls for the fan direction, which is also good if you want to direct the air in a specific position. Fan-only mode is present in some of these units. 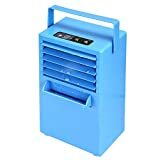 Portability: a good advantage of an evaporative cooler over an A/C unit is that it is quite portable, usually with wheels or very small and travel-friendly. This advantage over the air conditioning unit is what you should definitely find on your cooling unit so that you will definitely find it much more convenient and maybe even cheaper in the overall cost. Durability: you should know if the unit is durable enough to withstand many uses, especially if you will be operating it in really warm places like in tropical areas or in California and Texas. You should not compromise durability with a low price – pick one that is decently priced but will not get broken easily on its motor. Many cheaper ones are not very durable nowadays, so it is important to pick one that has a reputation for its motor. Warranty and return policies: like with most appliances and home conveniences, you should check the warranty policy of the manufacturer to make sure that you know when and where you can return it, as well as the returning conditions of the product. Remember that customer satisfaction is greatly important, especially if you paid a lot for your item, such as a cooling appliance. The Arctic Cove 700 is our top pick for the best evaporative cooler due to the diversity of the 3 speed settings while being simple enough to operate for anyone. The multiple speed settings help you to save up on electricity and motor lifespan overall. Its water capacity of 5 gallons can help you not to frequently change and refill the reservoir as compared to other smaller units, which is important for convenience and reliability. Like most evaporative coolers out there, you can just add water and ice so that you can power up the cooling power of this unit, especially on a very hot summer’s day. It can lower temperatures significantly even without the help of an air conditioning unit. However, this largely depends on your humidity and other outside factors, such as the intensity of heat in your area. To help save up on electricity, you can set the timer on the remote, especially if you will be using it for going to sleep peacefully on warm nights. It has been designed for 500 square feet of area and is also quiet so you can just use it for a bedroom and it will just sound like a regular white noise creating electric fan. You can also set it in the hallway to help cool some parts of your house while the remote control makes it easy to play with the settings. With an air volume of 700 cfm, it is great for hot climates and can save lots of money during the summer season. What’s more, the swinging vents distributes the air evenly throughout the room or area. 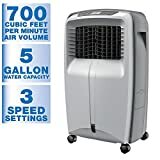 The only con but not a deal breaker with the Arctic Cove 700 is that it requires you to add a lot of water or ice into the reservoir, which is true for all evaporative coolers, anyway. As our step-up pick, the Cajun Kooling CK4500is pretty hefty in its capacity due to having up to 32 gallons on its reservoir, which can last from 8 to 10 hours. This means that it can be used for medium to large spaces or areas, such as patios, gardens, lawns and even medium sized warehouses or parts of it. This unit also has wheels for convenience, so that you can move it from one place to another – ideal for warehouses. This evaporative cooler has an air consumption of 4,500 cfm so it is quite powerful. As for the construction, there are external screens to keep dust away so that you will not inhale dust and dirt. Moreover, it’s really quiet when you get it to operate in your area, whether indoors or outdoors. There is also a shutdown valve on the pump to prevent the parts from wearing down when the reservoir is low on water levels. As a unit that requires less maintenance, its UV light system to keep mold and algae away so that you don’t have to fuss over cleaning it all the time and worry about the spread of bacteria and viruses. It has a total of 8 speeds to choose from and the weatherproof construction due to the UV-resistant plastic, making it ideal to cool off a patio. It also has washable screens that can be cleaned whenever possible to avoid contamination of the air in your area. Its timer can be set for up to 8 hours so you can save energy in the long run. The unit has an air drive of up to 40 feet away for its given power. For our budget pick, we chose the COMLIFE Personal Space, which runs on power via USB with 10W consumption, making it budget-friendly in terms of energy consumption and in initial costs as well. It has a sufficient 300 ml on its reservoir due to its small size, but it can last up to 8 hours if you let it run with the right amount of water. You can set it as a personal comfort zone cooling device at work/ home. Being quite small at 6 inches in its cube shape, it is portable, easy to use and only uses cold tap water to refill it, like with most evaporative coolers. It also has a fan mode and a humidifier mode so you can choose from different function in just one small desk appliance. It also has 7 unique color options with a color-cycle mode to add to its beauty. With a total of 3 speeds to choose from, this unit keeps you cool for up to 2 square meters, making it ideal for desks. It can also purify the air due to its additional functionalities. It has a cooling effect of 6 to 8 degrees Celsius and is backed by a 12-month warranty should anything go wrong with it. The Miaogo Space Cooler is a great choice if you just need a personal space cooling device for your desk or bedroom. It is USB powered so it is very easy to find a power source for it wherever you go, allowing you to stay cool even during travels. It only consumes 350 watts of power as a unit. This cooling device also cycles through 7 colors so it can also act as a great nightlight for kids. What’s more, the water tank lasts up to 8 hours so it can help you to sleep properly even on a warm summer vacation at a hotel or at the beach, lifting from 5 to 8 degrees of temperature in your area. It can be placed in a desk or bedroom or wherever you need it, and you can switch between the 3 wind speeds to match your needs of comfort and cooling. And because it is USB powered, it can run on your portable devices, such as a power bank or a laptop, but you can also connect it to a wall outlet. As a vacation buddy for cooling, it also potentially humidifies and purifies the air around you. If you want one that has colored lights that can act as a nightlight for children then the Miaogo Portable Blue could be what you are looking for. Unlike other units, this one uses ice to cool down and it holds up to 120 ice cubes. This may be a manual evaporative cooler but it definitely works for situations where you just need to cool down your food and drinks. Its design is so attractive that it can even sit in your nightstand for its lights. Also, it is USB powered so it is easy to find a power source for it while on the go, such as from your power bank or laptop. It can function also as a humidifier and a purifier while keeping you cool. Its airtight lid keeps the ice cubes away from bad odor as well, making it great for camping and picnics. The design of this unit is safe due to being FDA-approved, made with flexible food-grade silicone. Moreover, it is easy to clean due to being dishwasher safe. For those who need an evaporative cooler for large areas up to 2,300 square feet, the MasterCool AD1C7112 Down-Draft can be a good option for you. It has a thermostat so that you can set the temperature depending on the weather conditions outside and the temperatures that you need, so that you can be able to save more energy consumption in the long run for your next electric bill. What’s more, its bolted construction keeps welded seams away to prevent corrosion so that the unit can last for a longer period of time. It is also a good swamp cooler as well due to its 7,000 cfm air consumption, which is great not just for homes but also for commercial spaces and areas. This unit has a size of 19 3/4″ x 19 3/4″ for the duct opening so it is easy to install and can be powerful enough to cool down an area, with up to 75% increase in energy savings in estimation. It has a powerful 1 HP motor with 2 speed settings. The package includes motor, comes with two pumps and everything else needed to get started. Being made with durable heavy-gauge galvanized steel for its parts, it is also a UL listed unit for safety purposes. The Fitfirst Mini Portable is a great choice for those who are staying in dorms, condo units, apartment units and the like, or simply in smaller areas. If you need a cooler that can help you to stay cool for up to 8 hours, especially when sleeping, this is an economical choice. All you need to do is to fill it with tap water up to 300 ml on its reservoir. Measuring only 6 inches in size, this personal air cooler is easy to fit just about anywhere, especially on smaller spaces where bigger air coolers do not work well and can be bulky. It is also eco-friendly in its design and nature and has a cool 7-color cycle to make it attractive as a night light. Because it is USB powered, you can take it with you and power it up with a power bank or laptop, and have it only consume 10 watts of power on the go. It can cool from 6 to 8 degrees Celsius and it has a range of 2 square meters, so it is a quite useful personal cooling device. As a window type evaporative cooler, the Champion Window Evaporative is a great choice, as all you need is an outside water supply as this unit simply installs in a window. Its air flow is at 4,200 cfm so it is quite powerful for a unit. Its power cord length of 8 feet so it is easy to hook up anywhere as well. You can also set it at cool or vent mode (low and high settings) with its 2-speed motor with 1/3 HP, working powerful even in the hottest of summers in your area. It is a complete and ready to install package that can be filled with either a hose or manual fill system. It can be used for upstairs areas when it needs a lot of cooling there. As a UL listed unit, this evaporative cooling device has a water capacity of 12.5 gallons. It can you’re your house or room a steady flow of cool air as a unit that you could use in the summertime. Moreover, it has a cooling capacity of 1,000 to 1,400 square feet so it is great for small to medium sized homes. The Digitalboy Portable Air is a handheld and portable unit that comes with a top handle that lets you carry it anywhere you go, such as during vacation and traveling. It has a total of 3 speeds so that you can adjust according to the temperature in your area indoors or outdoors. Its large water tank of up to 420 ml of capacity allows you to spend more time cooling and less time refilling. With its energy saving capabilities, this cooling device also humidifies the air and can work for up to 4 hours continuously due to its sufficient reservoir, which also has a water shortage indicator for you to know when to refill. What’s more, the blades can be moved in their directions so you can be assured of evenly distributed cold air. Additionally, you can use it for humidifying by adding essential oils so it is a double function cooler and humidifier. Its noise level is less than 60 dBA so it can be alright for those who want to sleep with cool air from this device. It can spray up to 5 hours of humidification so it is great for keeping the air fresh and smelling pleasant. For those who need an industrial style evaporative cooler, the Hessaire MC92V Evaporative can be a great choice. It has an air consumption rate of 11,000 cfm and can cover up to 3,000 square feet of area – making it great for warehouses, industrial areas, workplaces and other open areas needing some cooling without the help of an air conditioning unit. The strength of this industrial powered unit is that it has a dual water fill option for convenience. What’s more, you can tell that it has been built for industrial purposes due to being included with a GFCI safety plug for wet conditions. This is important for areas in which work hazard should be avoided at all costs. 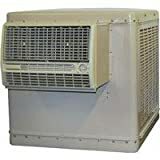 Other evaporative coolers did not make it to our list because they lacked in cooling power and were also not that easy to use. They were also too bulky to place anywhere and did not have enough capacity or reservoir for the ice, making replacement of the ice quite a chore to do. Q: What are the benefits of an evaporative cooler? Q: What are the different types of bedroom air coolers? Evaporative cooler – these are more ideal for dry areas. These are great for those with dry air and less than 50% humidity in their area. Swamp cooler – these are more ideal for humid areas. They are also cheaper in terms of price and overall consumption of energy. Window type air conditioner – this common cooling device is great for those who want intense cooling of any room but do not have a lot of space for a movable cooling device. Fans are simple and straightforward ways of cooling. Electric fan – this cooling device has a motor that spins and oscillates to create powerful air. It is great for moving air and producing a gentle breeze. It is also the least expensive of all cooling devices. Q: What are the differences between an air conditioner and an evaporative cooler? Air conditioners work differently from evaporative coolers. Technology used Uses Freon to cool down the air in your surroundings or room. Uses water or ice to evaporate and turn the surrounding air into cool air. Initial cost Air conditioners are usually very pricey in terms of the initial cost. They tend to be cheaper than air conditioners for the upfront cost. Operating costs Most air conditioners can have a high impact on your electric bill on a monthly basis. These cooling devices tend to consume less power and thus, become more budget-friendly for their operating costs. Ideal climate A/C units works on almost any climate, but they are perhaps the best for super humid climates. These are ideal for those with less humid climates and yet very warm in temperature. Q: Is an evaporative cooler better than a portable air conditioner? 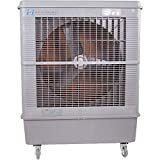 A: This kind of cooling device can be best compared to a portable A/C unit, which can be moved from one place to another. However, the deciding factor is their eco-friendliness. Air conditioning units use Freon to cool down the air, which can be harmful to the ozone layer when not managed properly. On the other hand, this evaporative cooling device only uses the simple concept of water or ice to cool down the air efficiently. Q: How is an evaporative cooler different from a dehumidifier? Purpose The main purpose of a dehumidifier is to keep the air in the right humidity by reducing it. These kinds of cooling devices cool the air and also add more humidity to it. Cost They tend to be cheaper because they are usually smaller in size as a unit. They tend to be more expensive but this depends on how small or big they are. Portable ones are usually cheaper. Health benefits Dehumidifiers are great for those who constantly have allergies due to a humid area. These cooling devices are eco-friendly and are healthy for your respiratory system. Q: How are they different from air purifiers? Air purifiers are also distinctively different from these cooling devices. Purpose The main purpose of an air purifier is to clean the air from unhealthy particles like dust. These kinds of cooling devices cool the air and also add more humidity to it. Cost Most of them can be expensive while others are a lot cheaper in price depending on the design that was chosen and the technology used. They tend to be more expensive but this depends on how small or big they are. Portable ones are usually cheaper. Health benefits They can clean the air from harmful dust, dirt, mold, mildew and germs that cause sickness. These cooling devices are eco-friendly and are healthy for your respiratory system. Some of them can also purify the air. Q: Can I use it in an RV or do I need an air conditioner for that? Cooling your RV in the summer can have added costs. A: RV air conditioners are more effective in cooling your RV, but if you do need supplemental cooling or if your RV A/C unit is broken all of a sudden, you may turn to the evaporative cooler to keep you cool in your vacation for emergency purposes. Q: What is Freon and why is it harmful? Freon is more commonly used in cooling appliances like air conditioners. A: Freon is a kind of chemical that can be identified as a household gas that can be harmful to the environment. Freon is also known as Difluorodichloromethane or CCl2F2 and can be used for fridge and freezer coolers and air conditioner coolers. The use of an evaporative cooler does not require Freon because it only uses regular water or even ice to cool down the surroundings. This makes it more eco-friendly in the process of cooling your room or area. Q: Is an evaporative cooler better than a wall mount fan? A wall fan may be cheaper but could be less efficient in cooling. Wall mount fans are less efficient in cooling effect. Wall mount fans are cheaper than these cooling devices. An evaporative cooler can be better in terms of cooling effect. Q: Should I buy an evaporative cooler that has an air purifying capability? A: Yes, it is worth investing in this kind of cooling device if it has an air purifying capability, because it has the capability to purify the air and cool it at the same time. This device is usually less expensive than regular A/C units but it will be worth the investment to have an air purifying capability to help the air be protected from contaminants. This can be helpful for your loved ones. Q: Can this kind of cooling device save more money than using an A/C unit? Size of your area This refers to the cubic meters or area of the room you intend to cool. Climate in your area This refers to whether you have a really humid climate or a dry climate. Kilowatt hour in your area Most countries have less expensive kilowatt hour prices but many are still in the problem of having an expensive electric bill, despite the efforts of saving energy. Q: Why is this cooling device an eco-friendly process? No Freon There is no Freon used in the process because it is only using natural evaporation process that involves only water or ice. Does not dry your air For those with problems of dry air with air conditioners, this evaporation process does not dry the air when you want to cool it down, making it more comfortable for those with irritation problems. No need for keeping air flow With an air conditioning unit, you need to keep your doors and windows closed to keep yourself cool. With an evaporation system, you don’t need to do that because air flow is constant. Q: How do I know the ideal cfm or air consumption needed for my room or area? A = area of your room in length, width and height. This would be your ideal air consumption for this room. Q: On what climate is this kind of cooling device best used for? A: This cooling device works well if your area has a humidity level that is lower than 60 percent or 50 percent. This means that cooling devices like these work more effectively in desert areas like in Texas or even some parts of California. It will still work on certain humid areas but not as effectively as it would on somewhat dry and hot areas. Q: How do you clean or disinfect your cooling device? Consult the user’s manual on how to clean the device. Try replacing the pads as recommended or at least after 1 year. Make a spray bottle using vinegar, purify oil, citrus bliss and optional essential oils. Q: Is it okay to add ice to my evaporative cooler? Some evaporative coolers can accept ice other than water. A: Yes, it is okay to add ice to your cooling device. This is because many of these cooling machines do have the capability to process ice if they have really large reservoirs. If it really gets hot in your area and normal water may not be doing the job properly, you can potentially go for ice other than water to speed up the cooling process or intensify it. Q: How often should I refill the cooling device? Know how frequent you use the cooling device on a daily or weekly basis. Determine what speed you frequently use on the cooling device. Know the capacity of the water reservoir in total. Identify the temperature indoors and outdoors. Q: What is the average power consumption of this cooling device? A: The power consumption of this cooling device, on the average, is about 193 watts. This can vary depending on the size of the cooling machine, the brand, the motor type and the speeds available. It can also vary depending on what the device is intended for – if it is for home use or for industrial use. Q: is it possible to use bore water for this cooling device? A: Bore water is a kind of water source that comes from underground. There are some evaporative coolers that might not accept bore water due to the presence of minerals that could potentially break some of the circuitry in the cooling device. It is best to ask the manufacturer first if the cooling device can accept bore water. Q: If my area is highly humid, will an evaporative cooler still work? A: Evaporative coolers will still work even if the temperature is highly humid. However, it will not work as effectively as it would on a dry desert in Texas. Most people resort to a swamp cooler instead of an evaporative cooler. However, it can be hard to distinguish both, because some manufacturers confuse swamp coolers with evaporative coolers, but they are different in terms of effect on humidity. Overall, the Arctic Cove 700 is our pick for the best evaporative cooler due to its easy to use remote control and its fan motor not being too noisy. It has a coverage area of 500 square feet, has a timer option, and you can add both ice and water to make the cooling power last longer.